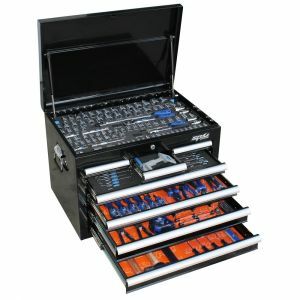 • All sockets, socket accessories and ring open end spanners come in hi-density foam tool storage system (EVA). • Chrome Vanadium steel for high durability. • Flat drive technology to maximize grip. • High polish finishes to provide easy clean-Up. 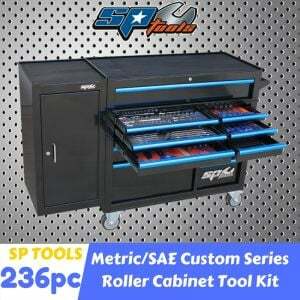 • SP Cliklok drawer locking system. • Extra heavy duty ball bearing slides. • Full roll cage protection. 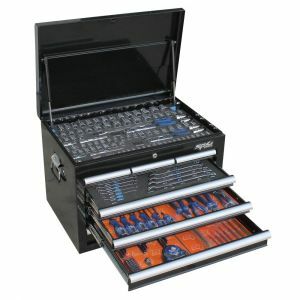 • Drop front security panel. • Skid rail base to provide reinforcement and extra protection.